T’ai Chi is closely related to Taoist Martial Arts or Wu Shu, in fact T’ai Chi itself is the oldest form of self defence practice but this aspect of the art takes many years to learn. 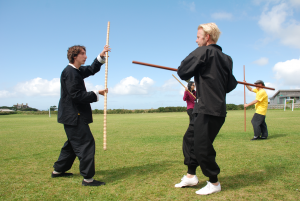 Wu Shu is a much quicker method because it relies partly on physical principles, it is particularly suitable for young people. The style we learn is called Feng Shou or Hand of the Wind Kung Fu. It is a soft or internal style which means that there is no blocking or hard physical contact. Instead you can learn to neutralise the attacking force by turning it back upon itself. This means training the sensitivity so that you can learn to read someone’s intentions even before they make a move. This kind of exercise depends upon relaxation rather than tension or physical muscular development. Lightness, flexibility and technique are emphasised and everyone is encouraged to train with a spirit of friendly co-operation rather than competitiveness. It involves learning to deal with punches, kicks or grapplers using a wide range of responses, but it is based purely on practical self defence skills which are unsuitable for use in competitions or as a sport. It is extremely effective and yet it does not involve any violence or aggression. Anyone who has marvelled at the spectacle of a little old man defeating people half his age and twice his size can appreciate that there is much more to self defence than just brute strength or muscle power. In fact the mark of a true Taoist is to have the maximum effect with the least amount of effort. Kung Fu training has its origins in China’s primitive period even before writing and the other civilized arts had been developed. In order to deal with wild animals and the incursions of barbarian tribes from the North the Taoists soon learned to apply their knowledge of internal medicine and physical culture to self defence. They developed a series of practical exercises which not only improved the flow of the internal energy through the body but refined the sensitivity and helped to focus the mind as well. In this way self defence training could be an integrated part of peoples lives yielding health benefits as well as practical skills. In modern China Wu Shu is practised in much the same way as sport or gymnastics in the west, to improve balance, flexibility and co-ordination, and to learn self discipline and control. 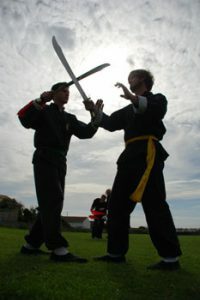 Feng Shou kung fu also includes weapons training using a Chinese broadsword which is a curved single edged sword and a staff. Chee Soo wrote an extensive training manual which details all of the most important aspects of Feng Shou hand of the wind training. This book is of particular interest to beginners who may wish to practice some of the exercises they have learned in a class at home. It is also of great interest to more advanced students because it has detailed explanations about the more advanced aspects of kung fu training including the process of developing inner power or chi energy. Each chapter contains detailed and practical step by step exercises which develop the skills necessary to learn kung fu including illustrations. At 240 pages this is the largest of Chee Soo’s training manuals. If you want to read more then you can order a copy from Seahorse Books.